The Story of the G.W.R. MONUMENT TO AN ENGINEER. The Great Western Railway’s Royal Albert Bridge at Saltash bears the name of I. K. Brunel, the Company’s famous engineer. This bridge, Brunel’s last and greatest feat of railway engineering, was opened on May 3, 1859. Isambard Kingdom Brunel died on September 15 of the same year. TO-DAY the Great Western Railway system owns 9,077 miles of single track. A century ago not an inch of that vast stretch had been laid. The story of the Great Western Railway’s rapid progress is one of the most interesting and most romantic in the history of railways. It is also a part of the story of England and Englishmen in the nineteenth and twentieth centuries. Isambard Kingdom Brunel is the man whose name predominates in this story, but before we learn more about this brilliant engineer we must consider the circumstances that led to the beginnings of the Great Western Railway. The opening of the Stockton and Darlington line in 1825 created a worldwide sensation. It was the heralding of a new era. Men discussed the possibilities of this new marvel of science and engineering. The merchants of Bristol, long dissatisfied with their had communication with London, began to wonder if this was not a solution to their problems. The Bristol Chamber of Commerce, the Merchant Adventurers and other local industrial bodies formed a committee in 1833 and discussed the ambitious proposal of laying a railway to London. Matters progressed swiftly. Money was advanced and the search for a first-class engineer was begun. A young man, Isambard Brunel, who had helped to build the Thames Tunnel and who had been appointed engineer of the Clifton Suspension Bridge, was among the many applicants for the post of engineer-in-chief on the new railway. His record showed him to be a man of exceptional brilliance and ability. In March, 1833, he was chosen to superintend the construction of the Bristol-London railway, which in the same year adopted its present-day title - “Great Western Railway”. Within a month of his engagement Brunel, the son of a famous engineer, had planned and drawn up a route from Bristol to London. When the directors of the newly formed company had approved of this route, a detailed survey of it had to be made for the purpose of presenting the scheme to Parliament and the passing of the necessary Bill. A prospectus of the railway appeared, complete with map, and declared that the chief aim of the railway was to be the transport of goods. Brunel’s route ran north of the Marlborough Downs via Reading and Bath. He selected the northern course because it offered better gradients and because it would easily allow extensions to be made later to Oxford, Gloucester and South Wales. West of Reading he planned that the railway should follow the course of the Thames and pass through the valley of the Chilterns. For a distance of seventy-seven miles the track would rise as it proceeded west to Swindon, never exceeding a gradient of 8 ft per mile, while the descent to Bristol was to be restricted to two short gradients of 1 in 100; one of these was to be through the Box Tunnel. 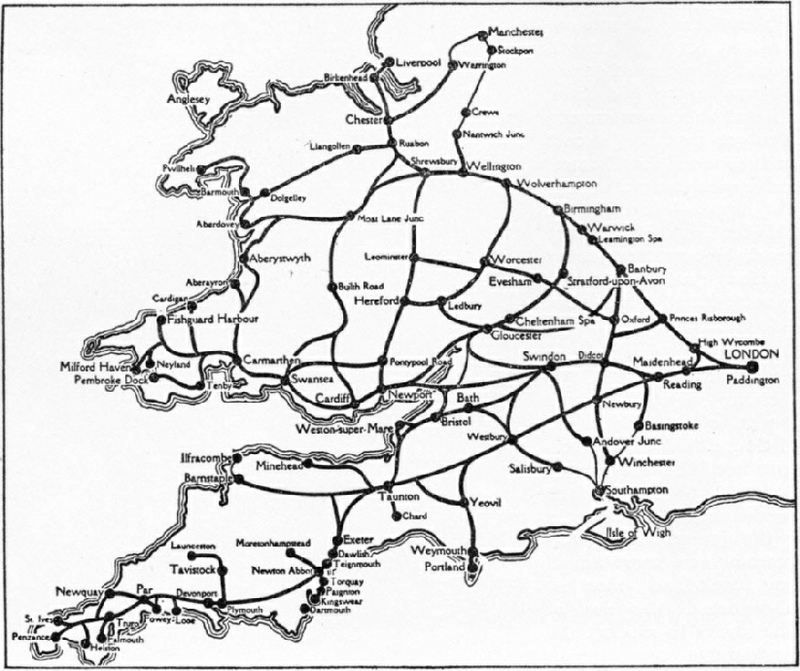 THE VAST NETWORK of lines operated by the Great Western Railway links London with the Welsh coal-mines, the rich industrial cities of the Midlands, and many famous holiday resorts. The Bill for the construction of the railway was passed in the House of Commons after considerable opposition, only to be rejected by the House of Lords. The supporters of the railway were not dismayed. Another Bill was prepared and, after violent opposition, this was passed and royal assent obtained. Work began immediately. A large part of the construction was put out to contract; navvies, many of whom had helped to build canals in early years, began their task. The knowledge possessed by these navvies of the character of rocks and soil, and their experiences in erecting embankments and making cuttings, proved of enormous value to the railway engineers. In 1835 there were no steam-shovels or mechanical excavators. All the excavating and construction was by manual labour. Many difficulties were met with and overcome. The Brent Valley, the Thames at Maidenhead and the hill at Sonning between Twyford and Reading had to be crossed on the stretch of track that was to be laid from London to Reading. Brent Valley was crossed by a 960 ft long viaduct, costing £40,000. Where the railway had to cross the Thames, Brunel built a brick bridge with two main spans of 128 ft with a rise of only 24½ ft, and the elliptical spans of Maidenhead Bridge are probably the most remarkable ever constructed in brickwork. The high ground between Twyford and Reading necessitated a two-miles cutting, sometimes of 60 ft in depth. One of Brunel’s chief ambitions was to build a railway on which trains could attain high speeds. With this aim in view he recommended a gauge of 7 ft 0¼-in, commonly known as the “Broad Gauge”. Although this was a radical departure from the other gauge in use, the 4 ft 8½-in gauge - now the standard - the directors, persuaded by the apparently excellent reasons for the innovation - agreed to it. Among the reasons were more ample development of rolling stock and smoother running. Brunei also urged the use of timber instead of stone blocks to support the rails, and spent considerable time in an endeavour to discover a satisfactory method of keeping the track steady. The terminus in London also presented a problem. Although an agreement had been reached with the London and Birmingham Railway to share Euston, the Great Western afterwards decided to have their own terminus, and chose a spot in what was then the country suburb of Paddington. This alteration of plans meant that complications arose, for Parliamentary sanction had then to be obtained. But the enterprising builders had already started on the work of construction from Acton to Paddington, and risked £50,000 in doing so. The Act granting permission to alter the route was, however, successfully obtained. The existing Paddington Station was built to Brunel's design in 1854, and has since been considerably extended. THIS MIGHTY EXPRESS passenger engine of the Great Western Railway, the “King George V”, is the result of a century of progress and development. The giant locomotive provides a striking contrast to the little six-wheeled engines employed by Isambard Kingdom Brunel to haul his first trains. The opening day in no way constituted a success so far as the running of the trains was concerned. The track proved very bumpy and uneven, while the passengers in the carriages suffered from the imperfections of the carriages which were badly sprung. The rolling-stock of these early trains was, of course, modelled largely upon the stage-coach and post-chaise in the first and second classes, while the third-class passengers had to content themselves with open trucks. The unsatisfactory nature of the line brought a storm of criticism, especially from the Liverpool shareholders of the Great Western Railway Company, who had favoured the narrow gauge from the beginning. Brunel, however, stood by his decision, and at a special meeting of the shareholders in 1839 the directors decided in favour of the retention of the broad gauge. Their decision meant the extra expenditure of many thousands of pounds which would be involved in the greater cost of laying down the broad gauge owing to the additional land needed. The traffic receipts on the new railway had, in the meantime, been very encouraging. As many as 10,000 passengers a week were carried. Early prejudices against the new method of transport were slowly vanishing: the authorities at Eton College, who had formerly regarded the railway's influence with disfavour, chartered a special train for the conveyance of their pupils. A year after the opening ceremony the Maidenhead Bridge was completed, and the railway reached Twyford. From here to Reading many difficulties were overcome. Bad weather handicapped the constructors, but Reading was reached in March, 1840. Hay Lane, near Wootton Bassett, eighty-three miles from Paddington, was reached at the end of the same year. While the railhead had been steadily advancing from the east, the western Bristol-Bath section had been opened in June, 1840. This division of the line, with its several tunnels, gave the engineers plenty of thought, but the last twenty-four miles out of the total of 118¾ between London and Bristol were the worst. The final stretch contained the famous Box Tunnel, which had been quoted as practically impossible to build, and in the event of its ever being built, it would both stifle and deafen the passengers on the train. The cost of driving this tunnel, one and seven-eighths of a mile long, averaged £100 for every yard advanced. Its construction was a great feat in those early days of railway engineering, and when completed it was the largest railway tunnel in existence. Similar in dimension to other tunnels for the broad-gauge double tracks. Box Tunnel measures 30 ft wide at the spring of the arch, and the crown is 25 ft above the metals. To afford thorough ventilation, Brunel sank six shafts 30 ft in diameter and varying from 70 to 300 ft deep, along the alignment of the tunnel. These shafts were used as bases from which excavating operations proceeded. During the construction of the tunnel the builders used a ton of gunpowder and a ton of candles every week. Although the safety of the tunnel was publicly disputed by a leading geologist, Brunel himself had every confidence in his work after its completion. But it was a long while before many passengers would trust the railway to take them through the tunnel, and they preferred to take a coach over a turnpike road and wait for the train at the other end. CHESTER RAILWAY STATION in the early days of the GWR. This reproduction from an old print is an interesting illustration of the conditions of railway travel in 1860 and of the fashions of that period. To overcome the public’s natural distrust schemes were put forward to illuminate the tunnel throughout by reflector lamps. 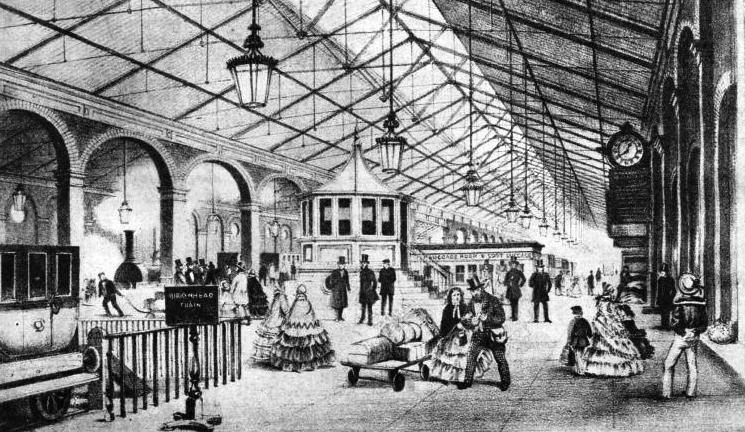 The Board of Trade reported that: “Lighting would add essentially to the comfort of the travellers, and in some degree to their safety, for as it is not the practice of this railway to have white lights at the head of the engines, the drivers have at present no means of discovering any obstruction that there might be on the rails in front of them”. The tunnel was finished in 1841, and the ambition of the Bristol merchants to see trains running from London to Bristol was realized. The railway child of the west was beginning to grow, and the decline of the coaching systems had set in. But the railway’s conquest of the west did not stop at Bristol. That was only the first battle. Beyond Bristol lay the important market town and agricultural centre of Exeter, and Plymouth Harbour. The advocates of the broad gauge determined to seize Devonshire and Cornwall. The Great Western Railway accordingly became associated with the Bristol and Exeter Railway, the South Devon Railway, extending from Exeter to Plymouth, and also other small railways. 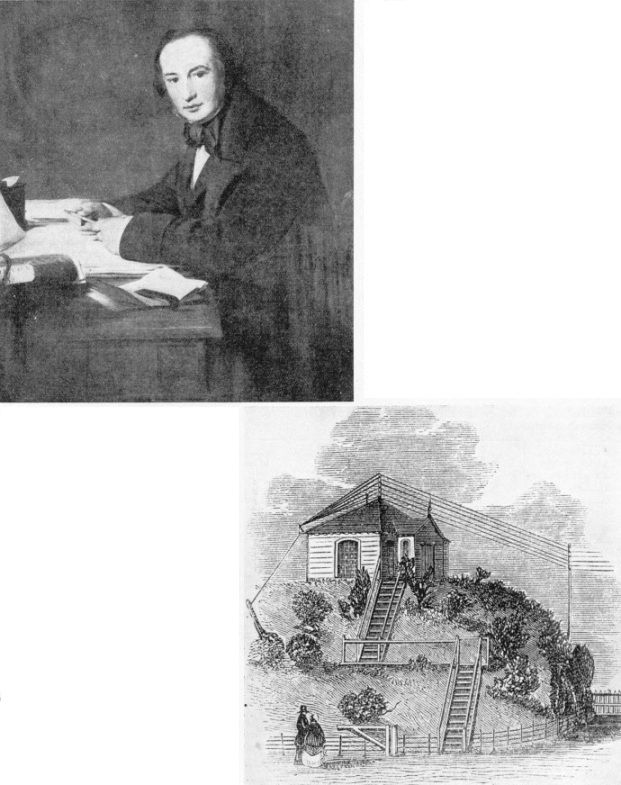 In each instance Brunel took charge of the engineering details of the railways. When the Great Western Railway had completed its London to Bristol route in 1841, the passengers could also travel on by rail to Exeter over the Bristol-Exeter’s company lines. This line was later worked in conjunction with and ultimately became part of the Great Western Railway. The first public excursion train was run from Paddington to Exeter in 1844. THIRD CLASS TRAVELLING in the year 1854 was a trial of physical endurance. No cushions were provided and, since these coaches ran on four wheels only, the jolting added greatly to the passengers’ discomfort. The people of Devonshire, witnessing the railway’s triumph elsewhere, soon began to demand a further line from Exeter to Plymouth. Brunel was once again called in on the behalf of what was then known as the South Devon Railway to plan the construction. He decided to pursue the right bank of the Exe to Starcross and then carry the railway along the coast past Dawlish to Teignmouth. Beyond here the rails were to run along the Teign bank. In order to take a fairly direct line to Plymouth the southern skirts of Dartmouth had to be crossed. Here some steep gradients were encountered, with one summit at Dainton before dropping down to the Dart Valley at Totnes, and a much higher one at Wrangaton. The railway was, in fact, difficult to construct throughout because the level part along the coast had to be laid between the sea and the cliffs. Delay was caused by the Admiralty raising objections, which were finally overcome. The railway was authorized in 1844. Work along the side of the Exe was hindered by low tides preventing boats from landing with material. A great sea wall had to be erected between Teignmouth and Dawlish to protect the railway. The uphill sections of the line, with some gradients as severe as 1 in 36, presented many problems. Brunel attempted to “bunch” the gradients in four inclines worked by some auxiliary power, and as he had long been interested in the atmospheric power system as a solution to the successful working of steep gradients, urged his directors to give the system a trial. FORERUNNER OF THE STEEL COACH. 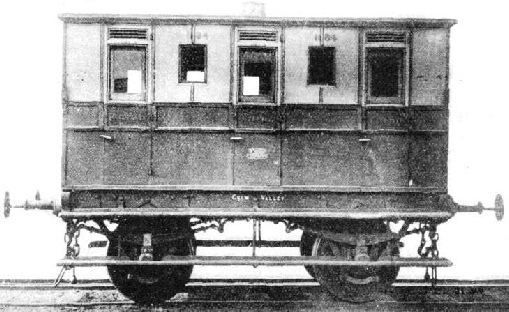 The bodywork of this early type of railway carriage was built of iron plates. Except for a roof overhead, the passengers were exposed to the weather. This picture provides an interesting contrast to the luxury of modern passenger travel. Atmospheric working had previously been experimented with near Croydon and at Dalkey in Ireland. The system consisted of a cast-iron pipe-line, about 20 in internal diameter, laid between the running rails. The pipes had a continuous slot along the upper side to enable an arm connecting an internal piston with the vehicles to be moved to travel along it. This slot was closed by a continuous hinged leather flap. The piston was attached to the forward end of a long frame, the arm to the rear end. An arrangement of wheels on the frame pushed up the flap in advance of the arm. When the air was exhausted by a pumping station from the end of the pipe, the piston was driven in that direction by atmospheric pressure, hauling the attached vehicle with it. The pipe-line was equipped with pumping stations at intervals of three miles. When a train was due, the engines exhausted the air, each ceasing to pump as soon as the train had passed. This system failed in South Devon, and temporarily injured Brunel’s reputation, but in 1848 the Exeter-Plymouth line was opened and the Torquay branch finished. The South Devon Railway was taken over by the Great Western Railway thirty years later, but there were other developments ahead. The next big step forward in railway progress in Devonshire and Cornwall was the extension from Plymouth to Truro and Penzance, started in 1853, after a preliminary delay due to a lack of financial backing. The railway had to be taken through a difficult terrain, and the chief characteristic of its construction was the thirty-four timber viaducts which had to be built over deep valleys. The viaducts were mostly of timber, but had masonry piers 66 ft apart, reaching up to 35 ft below the level of the track. The highest viaduct on the line is at St. Pinnock, and the trains are carried 153 ft above the ground. Nearly all these viaducts have since been replaced by brick and steel structures. 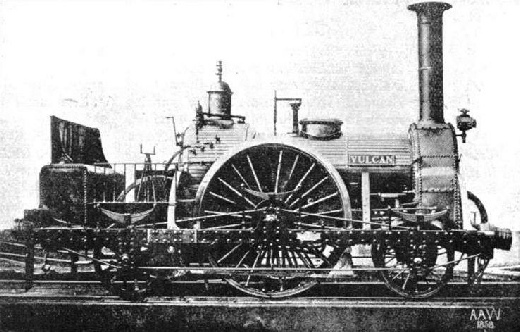 A FAMOUS GREAT WESTERN ENGINE, the “Vulcan”, built in 1837, and entered as Locomotive No. 2 in the books of the Company. The “Vulcan” had a single pair of 8 ft driving wheels and two cylinders 14-in diameter by 16-in stroke. 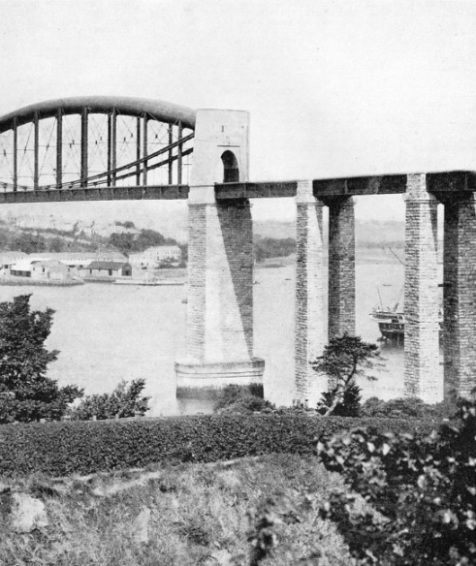 Compared with the Royal Albert Bridge across the River Tamar at Saltash, between Plymouth and Truro, however, the viaducts dwindle into unimportance. This bridge at Saltash was Brunel’s final and perhaps his greatest engineering achievement. The authorities demanded that it a bridge were built across the Tamar it should have a minimum headway of 100 ft. The river is 1,100 ft wide, and at first Brunel planned a bridge with one 850 ft span. The ultimate design contained a double-span bridge with long approach viaducts. The water was 70 ft deep, and Brunel had to find a firm base in the middle of the river for his centre pier. After the river-bed had been examined, Brunel found a site in the rock for the pier foundations. A huge cylinder was lowered down on to the rock. In the interior a masonry pier was built to a height above water level. On this pier four octagonal cast-iron columns were placed, of the same height as the two piers at the ends of the approach viaducts. The two huge trusses for the main spans were put together on the river bank. Of each of these the principal constituent, carrying the whole weight, was an arch-shaped oval tube 16¾ ft broad and 12¼ ft high. The bridge at Saltash has been termed a “combination of an arch and a suspension bridge”. Arch and floor are connected at eleven points by upright standards, which in their turn are braced by diagonal bars and carry the roadway girders. THE BROAD GAUGE “CENTAUR”, built in 1841, was in service on the Great Western Railway until November, 1867. This engine had two 15-in by 18-in cylinders (later enlarged to 16-in by 20-in) driving a single pair of 7 ft wheels. The task of raising the mighty trusses into position, 110 ft above water, was accomplished by floating them out into position by large pontoons. The trusses were raised in stages by hydraulic jacks placed underneath. Shortly after the opening ceremony in May, 1859 at which the Prince Consort was present, Brunel died, and Great Britain had to mourn the loss of one of the greatest engineers she has ever known. Brunel, although he died at the relatively early age of fifty-seven, had led a charmed life, for on several occasions his life was in danger. In 1838, while aboard the steamer Great Western, he fell down a ladder, and was found unconscious with his face in a pool of water. Twice he was nearly killed on the Great Western Railway; and he had yet another escape when he swallowed a half-sovereign which, after being six weeks in his windpipe, was at last extracted by means of an apparatus designed by the engineer himself. The patient was attached to an enlarged edition of a looking-glass frame and then the frame and the patient quickly inverted. After several attempts the coin fell into his mouth. While his life was in danger, public excitement was intense, so high was his place in public estimation. 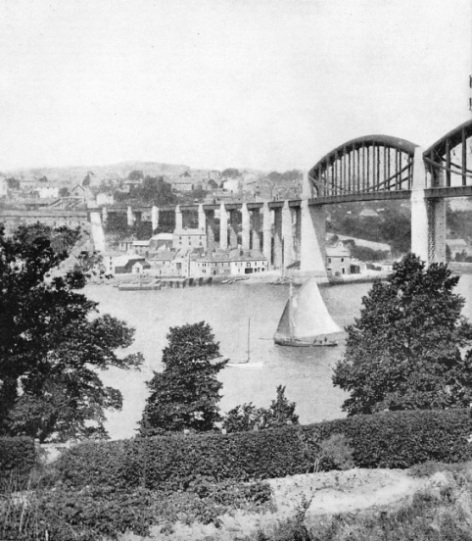 The completion of Saltash Bridge meant that a continuous run from London to Truro was now possible. A branch line to Falmouth was opened in 1863, being later extended to the new docks at that time under construction. While the Great Western was spreading its ramifications farther and farther out in the extreme south-west of England, it was also steadily pushing north across the Midlands - territory hitherto held by narrow-gauge systems. Small independent companies were absorbed by the broad gauge. In 1843 the Great Western took over the line from Swindon to Gloucester and Cheltenham. The following year saw the Oxford-Didcot line absorbed, and the year after that, 1845, two lines out from Reading to Hungerford and Basingstoke. Meantime, the advocates of the narrow gauge had laid a line from Birmingham to Gloucester in 1840 and were well established before the broad gauge arrived. Gloucester was the scene of the first battle in the bitter war between the rival gauges. The Midland Railway, formed in 1844, wished to buy both the Birmingham and Gloucester line and also another line between Gloucester and Bristol, because a conversion of the latter to the narrow gauge would give the Midlands a direct route to Bristol. The Great Western, which did not want a break in their system at Gloucester, was also eager to buy up the two independent railways; but the Midland outbid them and the broad gauge suffered a severe reverse. The clash between the gauges developed in 1845, when the mileage of the broad gauge system aggregated 274 miles, while the narrow-gauge rivals possessed over 1,900 miles. The narrow-gauge supporters claimed that as they owned a greater mileage, the later arrivals in the field should be those to convert. While the railway companies fervently debated the question, the public had to suffer considerable inconvenience arising from delays and changing over on to different lines at stations where the two gauges met. TRANSFER STATIONS were formerly very numerous on the Great Western Railway owing to the difference in gauges. Goods carried on sections of the line provided with standard (4 ft 8½-in) track, were transferred to the wagons of the broad (7 ft 0¼-In) gauge where the two systems met. This caused considerable delay and expense until the abolition of the broad gauge in May, 1892. The outcry grew in intensity, until in 1845 a Royal Commission was set up to investigate the state of affairs and to draw up a report with suggestions as to how the conflict might best be settled. The inquiry lasted five months, and the commissioners found feeling strongly in favour of the retention of the narrow gauge and the abolition of the broad gauge. Brunel was still convinced of the superiority of his track, and his Locomotive Superintendent, Daniel Gooch, put forward a practical means of testing the merits of the rival gauges. Gooch suggested that trains of equal weight should be run on journeys of equal distance over the different gauges. The result of these tests, which were carried out under the supervision and observation of the Commissioners, was definitely in favour of the broad gauge. The figures showed that the trains on the broad gauge were capable of far higher speeds and offered more safety to the traveller. But as the advantages of through travel without change of train was considered more important than high speed, the Commissioners recommended that the gauge of 4 ft 8½ in should be adopted in the construction of all future railways; also, that no railway should change its gauge without official consent; and, finally, that where the gauges met the broad gauge should give way. The Gauge Regulation Act of 1846 modified these recommendations, and declared that any gauge other than the 4 ft 8½ in could be used only under special authority, but at the same time permitted the railways of South Wales, Oxford and Rugby, and the Oxford, Worcester and Wolverhampton Railways to be laid down as broad-gauge tracks. THE LAST BROAD GAUGE TRAIN about to leave Paddington at 10.15 am on May 20, 1892. On Saturday, May 21, and Sunday, May 22, no fewer than 170 miles of track on the Great Western Railway were altered to the standard 4 ft 8½-in gauge. This meant that the broad gauge had access to the Midlands. And despite the continuous efforts of the London and North Western to obtain control over this intruder on its preserves, the Great Western had broad-gauge trains running into Birmingham by 1852, and had taken over the line completely in the next year. Later, a broad gauge track from Oxford to Wolverhampton was opened. It belonged to an independent company, and unlocked the door to the north for the Great Western. On from Oxford, the Great Western bought two other lines which, although narrow gauge, afforded the growing company a road up as far as Lancashire; but since the Government would not allow the introduction of the broad gauge on these northern lines, the passengers had to change at Oxford. This was in 1854. After that year the Great Western concentrated its energies almost solely on the west of England and Wales. The railway’s penetration into Wales began with a Parliamentary Bill to acquire the right to construct a railway from Stonehouse on the Swindon-Gloucester railway, which would cross the Severn near Newnham, reach Chepstow and then run on through Newport and Swansea, until it came to Fishguard. The construction of the bridge over the Severn was criticized on the grounds that it would impede shipping, but authority for a railway west of Chepstow to Milford was obtained. Permission was given later to extend the line from Chepstow to Grange Court on the railway from Gloucester to Hereford. The completion of the extension signified a through route via Gloucester and Swindon to London, and provided a most important outlet for the coal and iron of South Wales. These extensions were soon incorporated by the Great Western, which appointed Brunel to carry out the necessary engineering operations. Brunel’s major work in this part of the country included a bridge at Gloucester over the Severn, also bridges over the Wye and Usk, and a viaduct and a tunnel near Swansea. The construction of a bridge over the Wye at Chepstow was a most difficult task for the engineer. On the site of the bridge the left bank rises to 120 ft, while the opposite bank has a gentle slope to the water. As a headway 50 ft above the water had to be left for ships, approaches to the bridge were made at one side by cutting through the bank and at the other by erecting a lofty embankment. The length of bridging necessary measured 600 ft, which included a span over the Wye of 300 ft and three additional 100 ft spans over the land. The southern end of the main span was laid on large cast-iron cylinders. 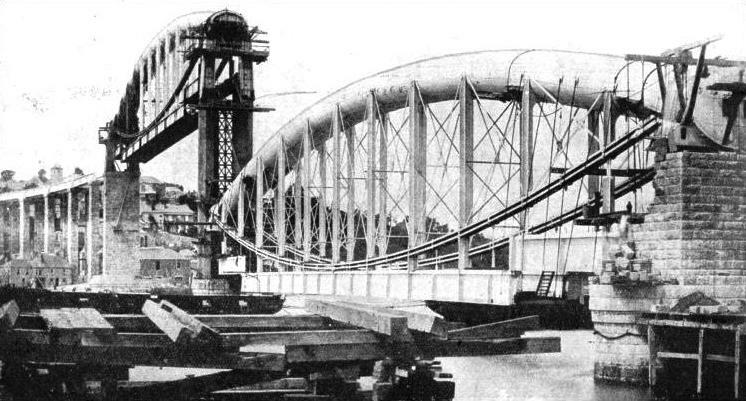 As the bridge was to carry a double track, a separate main truss was constructed for each set of metals. The trusses comprised horizontal tubes of 9 ft diameter and connected with the main girders carrying the track by a number of upright standards and suspension chains. AN OLD-TIME TRAIN at full speed. The chocolate and cream livery of the GWR. coaches has been in use since the time of Brunel. The year 1852 saw the completion of one line, and the second line was opened to traffic not long afterwards. To carry the railway over the Usk, Brunel built a timber viaduct which had a main channel span of 100 ft; but before the erection had been finished, fire broke out and destroyed much of the work. 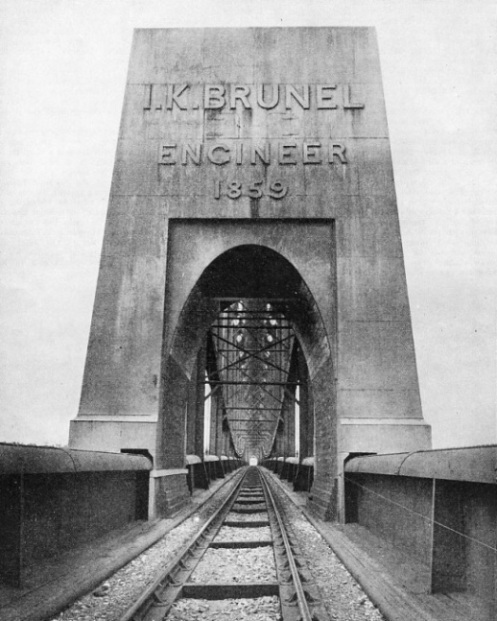 To prevent a recurrence of the fire, which had been caused by chemicals used to preserve the wood, Brunel invented the now common bow-string-shaped girders which replaced the wood sections. Owing to lack of financial support, the railway to Fishguard did not advance as rapidly as it might have done. The section from Chepstow to Grange Court was not completed until 1851, but during the next year, when the bridge over the Wye was finished, trains were running from London to South Wales. The terminus of the railway was then changed from Fishguard to New Milford, where the railway arrived in 1856. By 1861 the Great Western Railway had absorbed the smaller companies working these lines, so that at that date it possessed three chief routes, to Exeter, to the Welsh coast, and also to Chester. This way to Wales through Gloucester was a roundabout one, and between Gloucester and Swindon the trains had to face steep gradients. These two considerations caused a small railway, the Bristol and South Wales Union, to be laid between Bristol and New Passage on the left bank of the river Severn. As the river at this point is nearly two miles wide, a bridge was deemed impracticable and a ferry service linked up with the train service. Although this short cut reduced the journey between England and Wales, the service could not deal with heavy freight traffic. To improve this cut-off, absorbed soon after its opening by the Great Western, the engineers determined to build a lofty bridge across the Severn. Plans for a two-and-a-quarter-miles long bridge were drawn up, but this scheme was abandoned in favour of driving a tunnel under the river. The boring of this tunnel, sanctioned in 1872, was the greatest constructional task ever attempted by the railway up to that date. After the beginning of the great work came fourteen years full of constant anxiety and expense. “CONVERTIBLE” LOCOMOTIVES played an important part in the change from broad to narrow gauge. These engines, designed after the decision to change the gauge, were built with wheels outside the frames to run on the 7 ft 0¼-in track. After the change-over the engines were lifted off the broad gauge wheels and those of the standard gauge were fitted in their place, between the frames. Near the Monmouthshire bank the river contains a depression known as the “Shoots”, where the water is 50 ft deeper than in any other part of the channel. So that the tunnel should pass below this depression without the danger of flooding, the bore had to descend 140 ft below the level of the track on either bank, which involved boring a tunnel four and one-third miles in length with deep and long cuttings up to the approaches. Test bores revealed that the tunnel would have to be driven through rock for at least half its length. As a precaution, the engineers sank a shaft on the west bank and drove a trial heading under the depression. Work began in 1874, and progressed so satisfactorily that the preliminary bore was continued until a sudden incursion of water flooded the excavations and imperilled the lives of the builders. The company then turned for assistance to the engineer who had helped to build the Metropolitan and East London Railways, T. A. Walker. A contract was signed and this engineer recommenced operations by cutting off the subterranean spring which had caused the trouble; he did this by erecting large shields and pumping dry the borings. During these pumping operations a diver named Lambert performed one of the many heroic acts which have made the ease and comfort of modern rail transport possible. To close a floor door in the long heading under the river, the diver groped his way along through the water-filled passage in total darkness. He had to negotiate debris in the heading he had never seen, and pick his way blindly over beams, tools, rubber, and lumps of rocks for 300 yards. His return journey was even more dangerous, as the hose on which his life depended had coiled up round various obstructions, and the diver had to find and gather up these coils, which kept slipping from his grasp. The pumps often failed, but the workings were eventually freed and a wall built to keep the spring in check. This wall, however, did not prevent further flooding, and the entire enterprise was again in danger shortly afterwards when a high tide flowed over a low sea wall and spread over the low-lying ground. The water poured down one of the tunnel shafts and, had it not been for the desperate efforts of the workers on the surface in erecting a temporary dam, the excavators working in the tunnel would have been caught by the flood waters and drowned. THE SEVERN TUNNEL, which links England with Wales. This picture shows a modern Great Western Railway express leaving this famous tunnel, which was completed in 1886 at a cost of nearly £2,000,000. After this incident, work proceeded more smoothly; in 1884 the two headings met and a few months later the lining of the tunnel, which contained 37,000 tons of cement and 77,000,000 bricks, was completed, and a fan 40 ft in diameter was installed to provide ventilation. Water troubles still persisted, and in order to cope with them, permanent pumping stations were erected. To-day fourteen large pumps are at work raising 20,000,000 gallons a day from a second heading near the tunnel which serves to protect the main tunnel. The first train to pass through the tunnel was a coal train. This ran as a test on January 9, 1886. At the end of that year the authorities had examined and certified the tunnel’s safety. This famous tunnel, which reduced the journey between Cardiff and London by one hour, cost almost £2,000,000. The tunnel’s total length of 4¼ miles makes it the longest double-line tunnel in Great Britain. Roughly 3 miles of this distance is actually under the water, the remainder being the steeply inclined approaches, at 1 in 100 on the east side, and 1 in 90 on the west. The Oxford-Wolverhampton Railway previously mentioned on this page was one of the first of the former broad-gauge systems to convert to the narrow. The same railway later amalgamated with other narrow-gauge systems and became the West Midland Railway. The Great Western gained control over this new system, but only on condition that a narrow-gauge third rail was laid from Reading right into the citadel of the broad gauge - Paddington itself. The first narrow-gauge train left the Great Western’s London terminus in 1861. The mixing of the gauges had begun; eight years later the Great Western was running its own narrow-gauge rolling stock to Wolverhampton. ROYAL ALBERT BRIDGE spanning the estuary of the Tamar at Saltash, links Devon to Cornwall. The river at this point is 1,100 ft wide. The strength of the two great spans lies in the hollow curved elliptical wrought iron tubes, about 16 ft in major diameter, from which the bridge floor is supported. Each main span of the bridge is 455 ft in length, with long approach viaducts. The mixed gauge meant mixed types of locomotives, coaches and trucks, and miles of mixed tracks to be kept in order. These items meant a large amount of extra expense. The entire South Wales Railway, together with the Great Western’s main line from Exeter to Truro, was still broad gauge in 1869, when the Great Western determined to begin converting - closing up the 7 ft rails until they measured 4 ft 8½-in - instead of “mixing” the gauges by adding a third rail. An experimental conversion was made between Grange Court and Hereford, on the Hereford, Ross and Gloucester line. The twenty-two and a half miles stretch of line on which the test conversion had to be accomplished was far from easy, as it included short tunnels, sharp curves and difficult gradients. Three hundred plate-layers were given the task, which had to be completed within seven working days. The experiment was successful, and the engineers gained valuable information as to how future large-scale conversions should be carried out. They realized that every detail possible should be prepared in advance, that the men should not be divided into gangs shifting on as a section was converted, but that the whole line should be tackled simultaneously. The first large conversion took place in 1872, when the South Wales Railway from Gloucester to Milford Haven was taken in hand. To deal with 500 miles a vast colony of men, together with temporary living quarters, were transported to the locality. Apart from an almost negligible passenger service on one line, all traffic had to cease for five days. But within a fortnight narrow-gauge trains were in operation between Milford and London. After this the Great Western set about converting their whole system. On May 20, 1892, the last broad-gauge train pulled out of Paddington; this was the old “Cornishman” express. The conversion was a marvel of organization; 170 miles of broad-gauge track were changed to narrow gauge in two days, on May 21 and 22. Before the morning of May 21 every broad-gauge locomotive, carriage and truck was moved east of Exeter for dispatch to Swindon, where large numbers were reconstructed for the narrow gauge. Five thousand men were employed on the great change-over, which was accomplished without a single accident. The cost of the conversion, in relaying the track, and converting or scrapping engines and rolling stock, amounted to nearly £1,000,000. To the die-hard supporters of the broad gauge, who were so long blind to its disadvantages and so long insisted on the magnification of its merits, the passing of the original Great Western gauge, invented by the railway genius Brunel, represented stark tragedy. The next twenty-two years were not a period of great expansion for the Great Western, but rather a period of “peace, retrenchment and reform”. It was, in brief, an era of general improvement. Tracks were overhauled, cuttings widened, larger and better locomotives built and services speeded up. In the counties of Devonshire and Cornwall many miles of single track still existed, and with the ever-increasing popularity of the seaside resorts of south-west England, the Great Western included in its improvement programme the provision of double tracks on most of its routes in this part. BRIDGE BUILDING. Raising the great trusses of Saltash Bridge, each weighing 1,060 tons, to a height of 110 ft above the water, was a formidable task. The trusses, floated into position on iron pontoons, were lifted by hydraulic jacks, the masonry land piers being built up as the structure rose slowly to railway level. In addition, many important revisions were undertaken on main lines, in order to shorten them. The most important of these “cut-offs” was the present main line to the West of England via Westbury. The old “Berks and Hants” line to Weymouth was put into order for high speeds, and by sixteen miles of new track, from Patney to Westbury, the great circuit through Devizes was avoided. A new spur, twenty-four miles long, was then built from Castle Cary to Cogload, near Taunton, and the shortened route was complete. It cut twenty miles off the journey from London to Taunton, Exeter, and beyond. Similarly, the Badminton “cut-off” from Wootton Bassett to Patchway, where it joined the Severn Tunnel line, enabled South Wales trains to avoid Bristol, and shortened their journey by eleven miles. Another big project, part of which was undertaken jointly with the then Great Central (now London and North Eastern) Railway was the new route to the north, which involved sixty miles of new line from Old Oak Common, Acton, through High Wycombe and Bicester to Aynho, near Banbury. so cutting eighteen and a half miles from the journey to Birmingham and beyond. Altogether since the beginning of the present century the GWR has built and opened 160 miles of new line in order to “cut off the corners” of Brunel’s original routes, which earned for the GWR the nickname of the “Great Way Round”. The Great Western was also responsible for the construction of the Fishguard Harbour and the inauguration of boat services to Rosslare in Ireland. The railway extended its line from Letterston, and work on building the harbour and station began. The boat service came into operation in August, 1906. When the Great War broke out in 1914, the Government, by an Order in Council, assumed supreme control of all the railways in the United Kingdom immediately after the declaration. When the war was finished, the railways, the lines, the rolling-stock and plant which had been requisitioned by the Government were handed back to their owners, and a measure of compensation presented for the loss they had inevitably sustained. In 1921 a Railways Act was passed which grouped all the numerous lines and small independent companies into four big groups, excluding the underground and tube railways of London. All the famous old titles such as the “Great Northern” and “Caledonian” vanished - all, that is, except the Great Western, which was fortunate enough to retain its original name first adopted as long ago as 1833. The effect of the grouping of the Great Western’s mileage was to increase it by 560 geographical miles, and by 3,365 miles of single track, sidings included, as the system already covered very thoroughly the country between the London-Penzance line on the south and the London-Birmingham-Chester route in the north. In fact, as regards England, the amalgamations altered the map of the Great Western Railway very little, since the important constituent companies that entered the group are all in Wales. The capital of the company, however, was augmented by about £36,000,000, and 18,000 new employees were enrolled. One important effect of the railway grouping was to make the Great Western Railway the largest dock-owning company in the world. The railway controls docks at Cardiff, Swansea, Newport, Barry, Penarth and Port Talbot. The South Wales ports which came into the Great Western group handle about 50,000,000 tons of goods a year, three-quarters of which is coal, while the remainder comprises practically every other commodity exported or imported by Great Britain. The chief exports are coal, patent fuel, steel rails, plates, sleepers and other forms of manufactured steel; petroleum and motor spirit. The imports include pig-iron, timber, flour, fruit, fish, vegetables, dairy-produce, live cattle, chilled meat and general merchandise. In co-operation with the traders who helped to secure more economical and efficient transport of coal, the Great Western Railway successfully initiated in 1924 the adoption of a twenty-ton wagon as the new standard for the conveyance of shipments of coal in South Wales. The new wagon, considerable numbers of which are now in use, is intended to take the place of ten- and twelve-ton wagons. Apart from export coal, there are indications that the bigger wagon will also be utilized for inland coal, building materials and other heavy loads. RAILWAY HERALDRY. 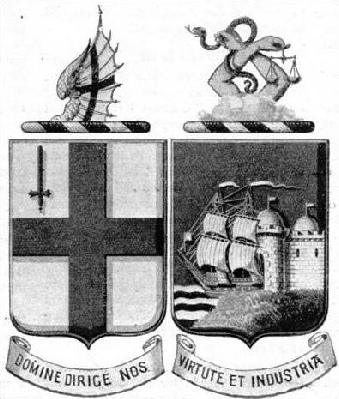 The Coat of Arms of the Great Western Railway combines the crests of the City of London and of Bristol respectively. The demands of London suburban traffic, which has enormously increased during recent years, have also been met by the Great Western. The Metropolitan Railway, which in 1854 was incorporated to construct a sub-surface line from Paddington Suburban to Farringdon Street, had a useful ally in the Great Western. And the Metropolitan was opened in 1863 as a mixed-gauge line, and was operated by the Great Western for six months. Nor was there a complete severance between the Metropolitan and the Great Western at the end of the period. The Great Western still runs “through” trains from its main line over the Metropolitan from Paddington Suburban to Liverpool Street. Another suburban line was opened in 1920. This is a stretch between Ealing and Shepherd’s Bush. Constructed and owned by the Great Western, it may be regarded as an extension of the Central London Railway, since it provides a through service from Ealing to Liverpool Street. Though only four miles in length, this line involved a considerable amount of engineering work, almost entirely on embankments or in deep cuttings. Over 600,000 cubic yards of earth had to be excavated from cuttings, and of this quantity about one-third was utilized for the embankments, which reach a maximum height at East Acton Station. In order to reach Ealing, the northern side of the cutting east of the Broadway Station had to be cut away, and supported by a heavy retaining wall; and nineteen bridges were required, fifteen of which cross over the line. These were designed to permit quadrupling the track should it ever be necessary. The development of speed which is the natural outcome of the development of the locomotive has been treated in an earlier chapter of this work, and the evolution of the first two locomotives of the Great Western system, the “Vulcan” and the “North Star”, to the present-day “King” class locomotive has been demonstrated. But the increase of speed must go hand in hand with an increase of comfort. And so it has done. The test runs of the first locomotives of the Great Western averaged between twenty-eight and thirty-three and a half miles an hour. These pioneer trains were composed of crude, coach-like vehicles for first and second class passengers, while the unfortunate “thirds” had to content themselves with an open truck and a few cross planks for seats. To-day express engines think nothing of over sixty miles an hour averaged over long distances with luxuriously appointed trains behind them. When the early railways were planned the Boards of Directors had their eyes chiefly on the people who used the stage-coach or chaise. They were assured that, if a superior class of carriage were provided for the chaise folk and the “insides”, with a less comfortable class for those normally content to travel outside a coach, anybody desirous of cheaper seats should have to share the unprotected conditions which the driver and fireman had for long to endure. An Act of Parliament passed under Gladstone’s premiership in 1884 [sic] decreed that even third-class passengers were to have a covered carriage and be conveyed at a minimum average speed of twelve miles an hour. A special effort was made to improve the nature of the rolling-stock when Queen Victoria travelled by rail - which she did for the first time in 1842. The original Royal carriage measured 21 ft long and was divided into three compartments. It had large windows and was carried on four pairs of wooden wheels with steel tyres. Private firms built and supplied general rolling-stock for the Great Western until 1867. After this date improvement in design and comfort began. A 46 ft coach with eight wheels appeared in 1874, and about that year the lighting of trains by dim and evil-smelling oil-lamps was replaced by gas compressed in cylinders and burners of a crude type. Not until 1873 was steam-heating of the compartments introduced. The end of the century, however, saw a train fitted with electric light. The new era of the hotel on wheels, the trans-continental expresses and the wagons-lits, had dawned upon a new railway world. Mention must be made of the Great Western Railway’s two world-famous expresses - the “Cornish Riviera” and the “Cheltenham Flyer”. The former express came into service in 1904 on what was then the world’s longest nonstop run. The train left Paddington daily and was not scheduled for a halt until it arrived at Plymouth, 245¾ miles away and 265 minutes later. To-day the “Cornish Riviera” runs non-stop from London to Plymouth, over the 225½ miles of the shortened Westbury route, in four hours, and the complete journey to Penzance takes six hours twenty-five minutes. This is during summer; in the winter a stop is made at Exeter. For over twenty years this train held the world’s record for the longest non-stop run. It was also unique in that it carried three slip portions detached at speed at Westbury, Taunton and Exeter. The Great Western Railway claims the record for the highest speed ever attained by a steam train in Great Britain, i.e. 102.3 miles an hour in 1904, by a Plymouth to London mails special. The “Cheltenham Flyer” is the world’s fastest steam train operating on a regular time-table. It is booked every day to cover the stretch of 77¼ miles from Swindon to Paddington at an average speed of 71.4 miles per hour. in sixty-five minutes, and this time has been frequently improved on. The quickest record was achieved on June 10, 1932 when the “Tregenna Castle” ran from Swindon to Paddington in fifty-six minutes, forty-seven seconds at a start-to-stop average of 81.7 miles an hour. Another noteworthy service is the “Aberdeen to Penzance Through Express”. This service enables a passenger to travel the 785 miles from the Scottish port to Penzance in twenty-one hours. fifty minutes, or in the opposite direction in twenty-and a-half hours, without changing carriages at an average speed of 36 to 38 miles an hour. This longest non-change journey in the United Kingdom is made possible by the co-operation of the Great Western and London and North Eastern groups. Comparisons between the old and the new are invariably misleading. Only the salient factors are taken - one remains ignorant of the difficulties, the problems, the conditions and, above all, the outlook of the past generation, however hard one may try to appreciate the problem i that confronted our forefathers. But to compare the Great Western Railway of 1838 with the vast system of to-day is the only way in which the miracle of a modern railway can be appreciated. To trace its gradual growth from nothing is like reading a biography of a man’s life; where there is energy, evolution must of necessity result. ON PARADE. A magnificent line of “Kings” outside their engine-sheds ready for service. 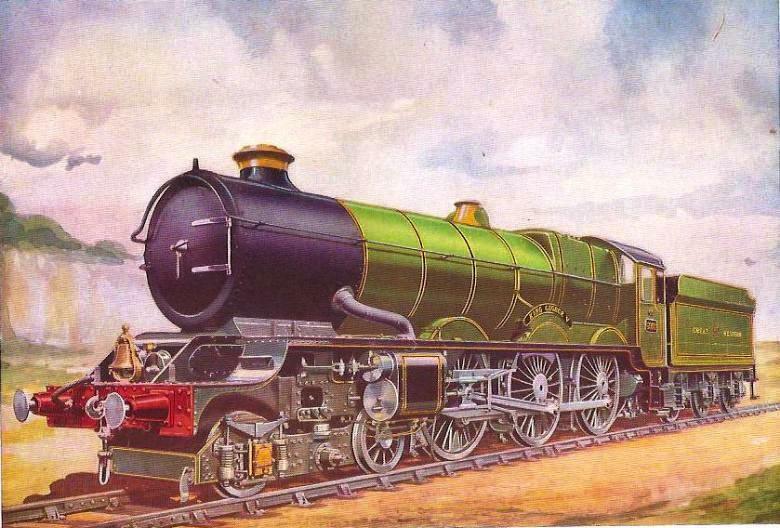 Locomotives of this class have won for themselves an enviable reputation for economical running, as well as for their ability to haul to scheduled time the heaviest GWR expresses. You can read more on “The Fishguard Boat Express”, “How Mighty are the Kings”, “The Great Western Railway” and “The Torbay Limited” on this website. ISAMBARD KINGDOM BRUNEL. the brilliant engineer who planned the original Great Western routes. 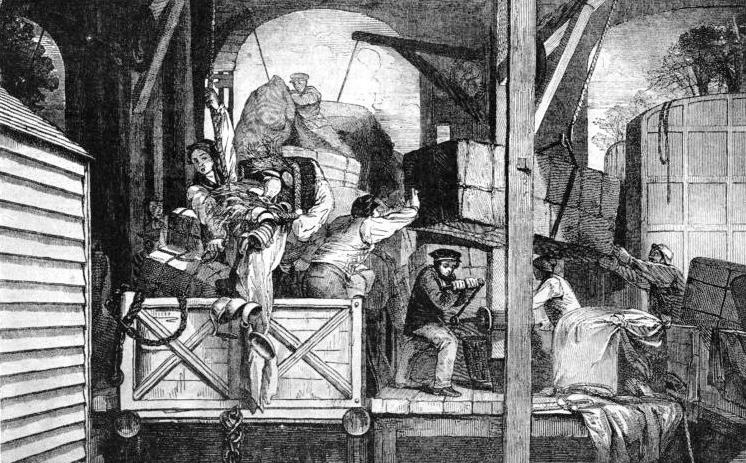 THE FIRST TELEGRAPH STATION, opened at Slough in 1843, was linked with Paddington Station. So great was the public interest in this invention that a fee of one shilling was charged for admission.